The 2nd generation of the mysterious creature from the outer space--the Species dominates the whole universe again, who perfectly combines the vaping and high-tech to bring you wonderful vaping experiences. Species has an angular mod with hard lines, which reflects its sublime heroism. 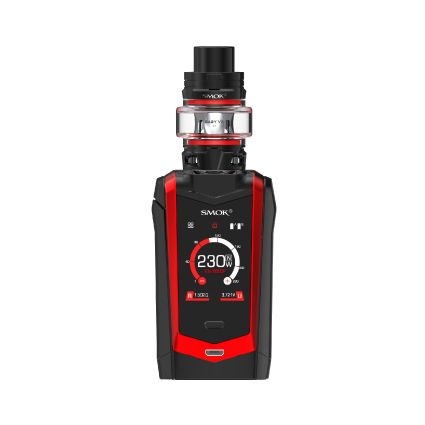 The front brand new 1.45'' high-definition touch screen with upgraded user interface offers you more comprehensive and clearer vaping data, while the back classic cobra pattern reveals its domineering potential. Moreover, the screen locking button ensures a safe operation. And its 1W-230W output can meet your various demands. Species uses the newly developed TFV8 Baby V2 tank and adopts two powerful coils--- Baby V2 A1 Coil with super large heating area and Baby V2 A2 Coil with dual heating cores, fully satisfying the vaping fans' pursuit of dense flavour and massive cloud. Innovation keeps changing the vaping experience!